A couple weeks ago, my company had a “Sangria Off,” where participants were charged with trying to create the best sangria amongst competitors. I studied abroad in Spain, and although I drink sangria whenever I have the chance, I’ve never actually tried to make it. While doing some research, I came across an awesome infographic that breaks down the different steps and ingredients to creating the perfect sangria, with several options for each step. 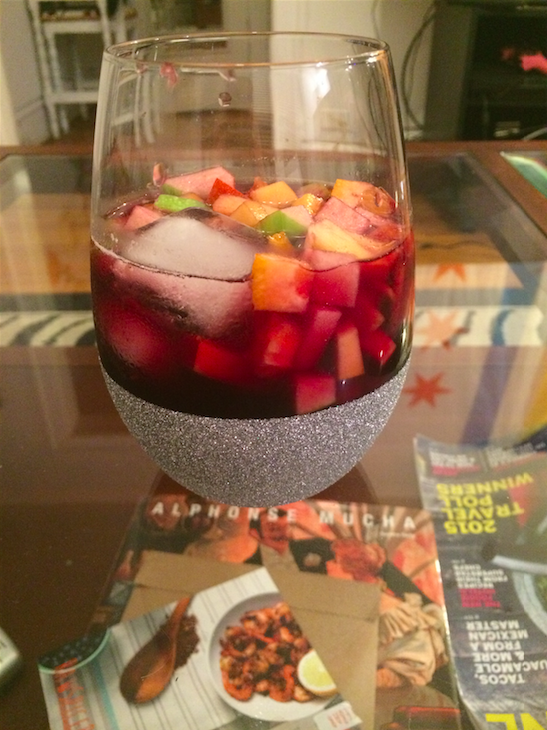 If you want to make a white wine sangria (aka, a totally different drink), I’d suggest Cava. It’s a mix between a champagne/non-bubbly white wine, and is made in Northern Spain. Also goes great in mimosas! Brandy is the standard. Honestly, I didn’t want to have brandy sitting around after this contest, so I got light rum. I guess it depends on your tastes – and how committed you are to winning. Sangria has a LOT of sugar. I used a mix of honey and sugar to get a more interesting taste. I used tonic water with lime. I think seltzer or ginger ale would produce very similar effects, so go with what you like. I added in fresh squeezed orange juice to my sangria. I think fresh squeezed lemon juice would play well with the refreshing nature of the drink as well. Depends on personal preference. Would’t hurt to add both! 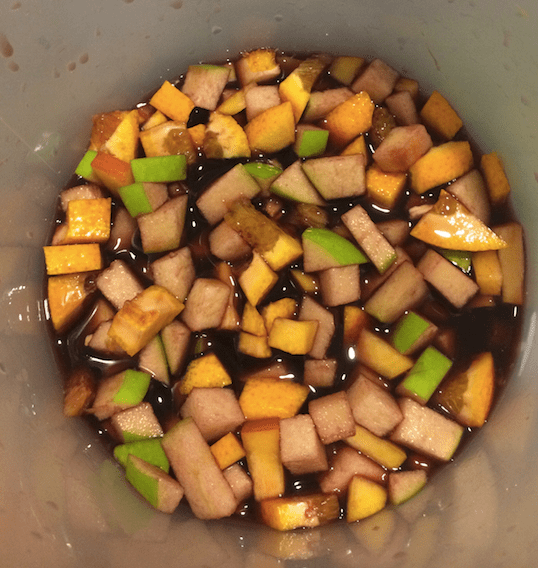 The last but critical step – you can’t have an awesome sangria without fresh diced fruit. I added peaches, apples, and oranges. Berries would also make an excellent addition. Again – it’s all about what tastes good. The important thing to note is that you should dice the fruit up small for a visually-appealing effect. I didn’t put any garnishes on my sangria, but I think putting mint leaves in each glass would’ve sealed a win for me. Definitely something to think about for next time! 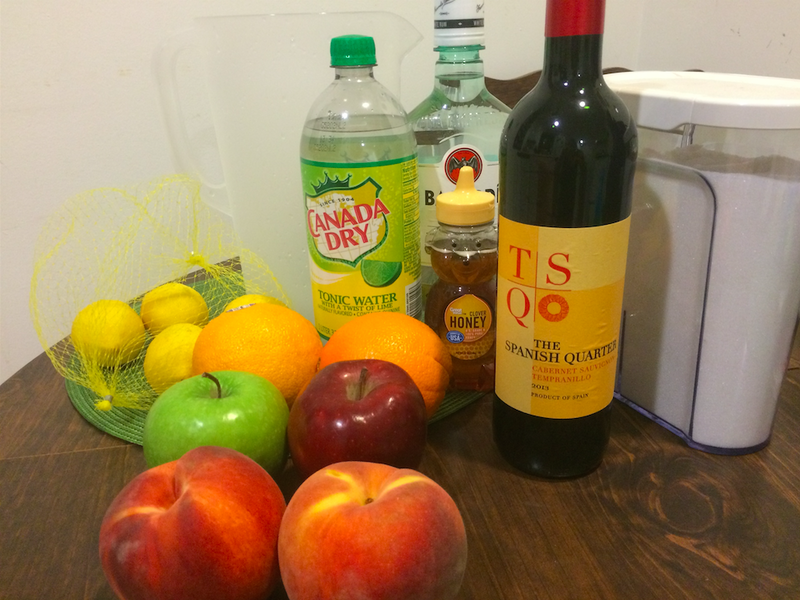 Finally, if you want to win at sangria making – make sure you let the sangria sit overnight! Trying to make it the day you serve it will not give it enough time for the flavors to fuze together. Have you made sangria before? What’s your favorite recipe?